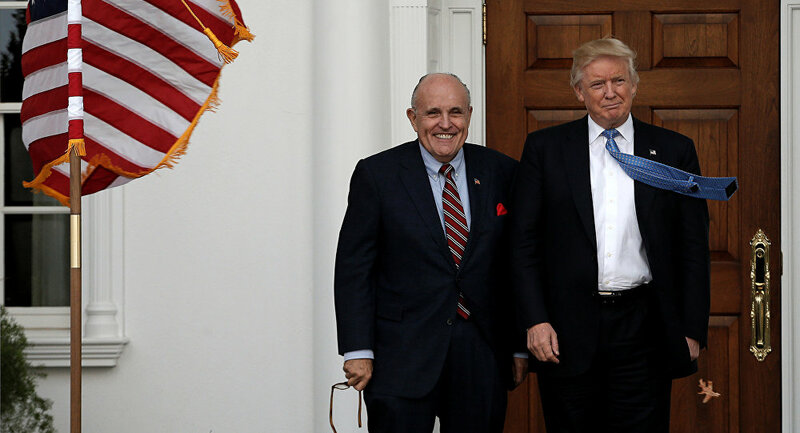 The US president’s lawyer Rudi Giuliani has denounced a passage from special counsel Robert Mueller’s report, saying it “does not exonerate” Donald Trump on obstruction of justice, as “a cheap shot”. "This is unprofessional…They don't have to exonerate him, you gotta prove he's guilty, even for impeachment”, Giuliani told CNN. According to the lawyer, Trump "is exonerated in the next two paragraphs" that say “not sufficient evidence” and “no obstructive conduct”. "That's exoneration by Rod Rosenstein [Deputy Attorney General], the attorney general [William Barr] and the Office of Legal Counsel”, Giuliani said, pointing at Barr and Rosenstein’s decision not to start a prosecution of Trump over the obstruction of justice allegations as the evidence was "not sufficient”. Giuliani’s word offensive has received a mixed reaction online. Some took an opportunity to trash the lawyer. Rudy Giuliani is an expert on things that are unprofessional for former prosecutors. You get what you give, @RudyGiuliani. If you think it's shabby, grab a mirror. Rudy speaking to unprofessionalism is…amusing, to say the least. ​Others sided with Trump’s confidant and accused the media of bias during the investigation. COMMON SENSE: This exchange between Cuomo and Giuliani shows just how deceived the mainstream media has been about their false narrative. ​The attorney general quoted the line in question as he presented the summary of Mueller’s report to Congress. A summary of special counsel Robert Mueller’s investigation by Barr released Sunday after a 22-month-long investigation said that there was no conclusive evidence that Trump obstructed justice in the probe. Additionally, it said no proof of coordination between Russia and the Trump campaign during the 2016 elections in the US had been found. Trump told reporters afterwards that "hopefully, somebody’s going to be looking at the other side”. However, the report was not fully released. While the White House indicated that the president will leave it up to the attorney general to decide whether it should be made public, the US Democratic congressional leaders, House Speaker Nancy Pelosi and Senate Minority Leader Chuck Schumer, called for a full release. They argued that US Attorney General William Barr had a "public record of bias against the Special Counsel’s inquiry" and was therefore not a "neutral observer" who would be in a position to summarise the report. However, Republican Majority Leader Mitch McConnell said later that he had blocked a second attempt by Democrats to pass a measure for a proposed bill calling on the US Department of Justice to publish the document.